This quilt was a fast finish because I had a deadline to mail it to the US to a very special couple from Annapolis, MD, J L and Carlene Thomas. 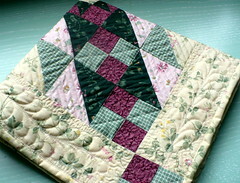 Although I did not do any free motion quilting for a very long time, I was surprized that I did not loose the skill. 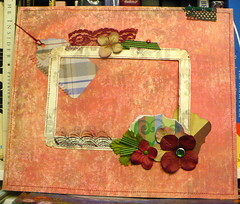 I had a bit more than an hour to creat a srapbook frame to go with the quilt. The colors are much more beautiful in real life.I challenged myself to create this gift within a hour while my children were taking a nap. The quilt and the frame had to be packed and go the same night.